« Arsenal v Tottenham. Chapman’s first match and the first match under the new offside rules: 29 August 1925. The original big clock at Highbury was placed at the rear of the then uncovered Laundry End of the ground (which later became the North Bank), on or around 10 September 1930. The source for this is a picture in the Daily Mirror on that day. The picture shows a 45 minute face. Other sources state that the end of each half would be announced by a klaxon and that the clock measured 8 feet 6 inches across. Thus fans who did not carry their own wrist watches (the majority at that time) were shown how much time there was in each half. (There being no substitutes, and fewer visits from medical staff, interruptions were fewer, and so halves really did last 45 minutes, and 3pm kick offs did end at 4.40pm, and people left the ground to the accompaniment of newspaper vendors shouting, “All the half-times, 3.30 winners”). However the almighty and wondrous Football Association, of whom it has been said, felt that this ticking of 45 minutes would provide far too much information to the fans, would distract them from the game and undermine the credibility of the match officials (as if such a thing were ever possible). Thus it was that the ever innovative Arsenal were ordered the club to remove the offending instrument of time. The club naturally had to obey the instruction but rather than remove the timepiece (which the FA had clearly intended but didn’t actually say) Arsenal simply changed the clock so that the clock face showed the normal time of day. Although such a matter was beyond the grasp of the toffs then running the FA, the average man and woman who attended football matches was more than able to read the time, and so a clock ticking round from 3pm, 2.45pm, 2.30pm or 2.15pm (depending on the time of year – the daylight naturally affecting kick off time in these days before floodlighting) could tell them exactly what the 45 minute clock had told them. With the College End of the ground (named after… well you get the idea) remaining uncovered, the clock was placed at that end, and this quickly became known as the Clock End. Different clock companies were charged with maintaining the clock which did actually break down occasionally, something that became quite a talking point during the Wright era when the clock was pretty much all there was to keep the crowd awake. By the time of the move to the Ems it was in the hands of Smith of Derby. When Arsenal FC moved from Highbury to the Ems, the club claimed that the original clock on the south bank was saved and moved to be put on the stadium outer wall facing what then became the Clock End Bridge over the railway. However, as noted below, there is the strong claim that the clock that transferred to the Emirates only made its debut at the start of 1989 – but somehow the Club has always passed it off as the original. “The old one had been taken down temporarily to build the executive boxes but, as I recall from the Islington Gazette, was spotted on the site in pieces. A new clock was knocked up in haste and no attempt at all was made to copy the style of the digits (nor the minute segments) – which the Gazette demonstrated back then and can easily be seen online today.” (see comments below). The move of the clock took place on 27 July 2006 and this Highbury clock was lifted into its new home on the wall of the Ems by a 25 tonne crane and took four people nine hours to install. After the removal, Smith of Derby also built a half-size (ie 1.3m diameter) replica of the clock which is place in the Diamond Club within the stadium. Then on 21 August 2010, ahead of the home game against Blackpool, (a 6-0 win I seem to remember after which the Blackpool manager paid tribute to Arsenal’s style and approach) a new version of the clock, suitably scaled up in size to be appropriate to the Ems was unveiled at what was the South End (officially called the Maroon Quadrant, or some such colour – I really can’t remember which) of the ground, and this quickly became renamed as the Clock End. It was the tick-tock of Arsenalisation. The greatest hat trick ever by an Arsenal player? I was under the impression that the first clock was installed in September 1930, as a 45 minute timepiece. It appears that Andrew is right. Just checked and the front page of the Daily Mirror of 10 September 1930 has a picture of the clock being erected at the Laundry End. It clearly shows a 45 minute face and states that the end of each half would be announced by a klaxon. Another correction to the club’s history. Well spotted Andrew. Any idea how the information you had deviated so much from the actual installation date? Andrew: Much of the time I am working from two or three sources, and if they are together on something that’s what I write. The great thing about the blog is that it allows for corrections. 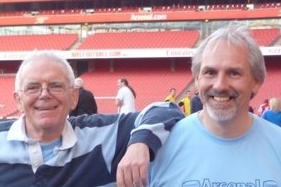 Indeed it has been said both here and in general Arsenal History Society statements that the blog is the scratch pad – the place for trying out ideas and looking for corrections. Sometimes I find them myself, but mostly I am grateful to the work of everyone else who puts me right. The positive side is that we are getting closer inch by inch to the correct history of Arsenal. The clock that transferred to the Emirates only made its debut at the start of 1989 – but somehow the Club has always passed it off as the original. The old one had been taken down temporarily to build the executive boxes but, as I recall from the Islington Gazette, was spotted on the site in pieces. A new clock was knocked up in haste and no attempt at all was made to copy the style of the digits (nor the minute segments) – which the Gazette demonstrated back then and can easily be seen online today.